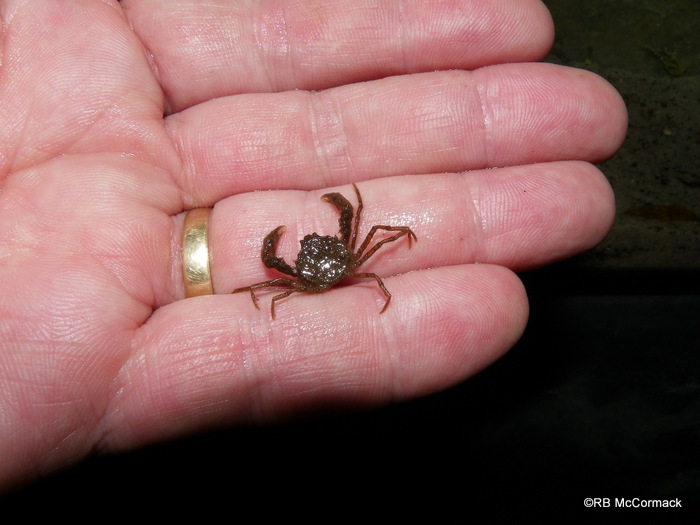 False spider crabs Amarinus lacustris are a widespread and relatively abundant small crab species inhabiting low salinity and freshwaters waters in south eastern and eastern Australia, New Zealand, and Lord Howe and Norfolk Islands. 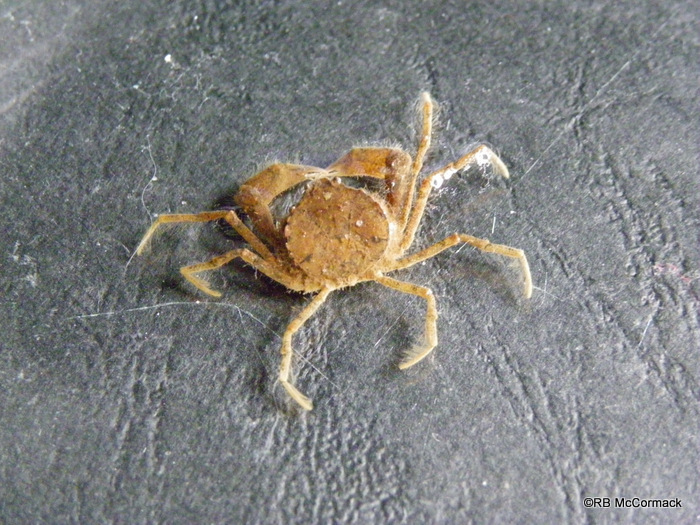 They are a small freshwater crab species only reaching 10 mm in body width, with a distinctive H-shaped groove on their back. 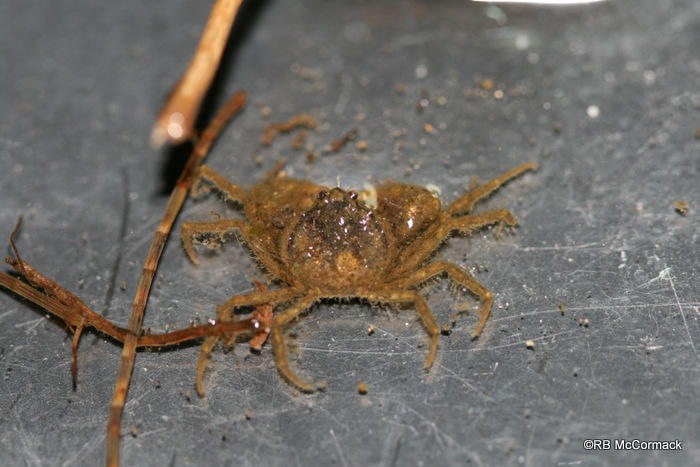 They are a slow growing species that can be covered with weeds or algae growing on their shell which makes them harder to see and for predators to find. It’s a small vulnerable species that is cryptic in nature and rarely seen or captured, spending most of their life hiding in thick reeds and roots or under rocks that offer protection and shelter from predators. Though widespread and when present they can be abundant (the ACP has found them at over 100/m2) they are a cryptic species that makes finding them difficult. 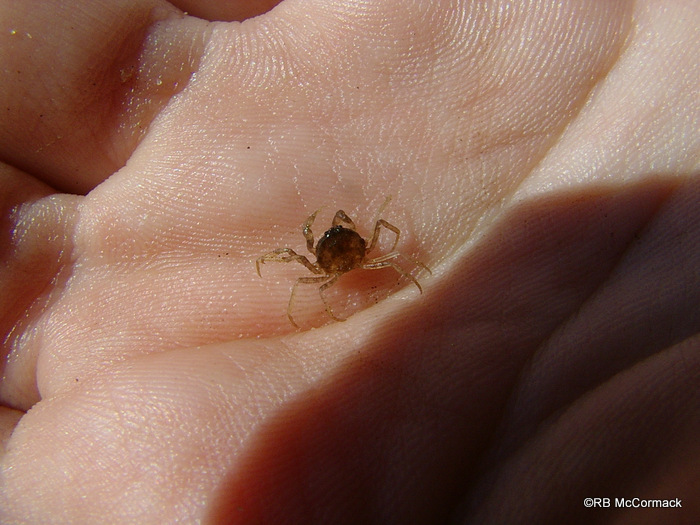 The knowledge base on this species is relatively small, additionally, little has been done on the taxonomy and genetics of this widespread crab species and it is currently proposed that the current description may in fact represent three or more distinct species. The ACP is intensifying research on this species and continues to collect specimens from across Australia. As we collect more specimens we are getting to know their habitat preferences and it’s becoming easier and easier to find these elusive creatures.